I've seen The West Wing, so I know that the White House Press Secretary's day is filled with "walk and talks" and witty, off-the cuff remarks. Well, I suppose Hollywood probably took some creative license on that, but according to current White House Press Secretary, Josh Earnest, the popular TV show and reality aren't completely different. Earnest says that some days seem "like an episode of The West Wing." But more on that later. Earnest has been Press Secretary since June, 2014, but he's been working in the White House for the entire Obama Presidency and was a member of Obama's campaign team. 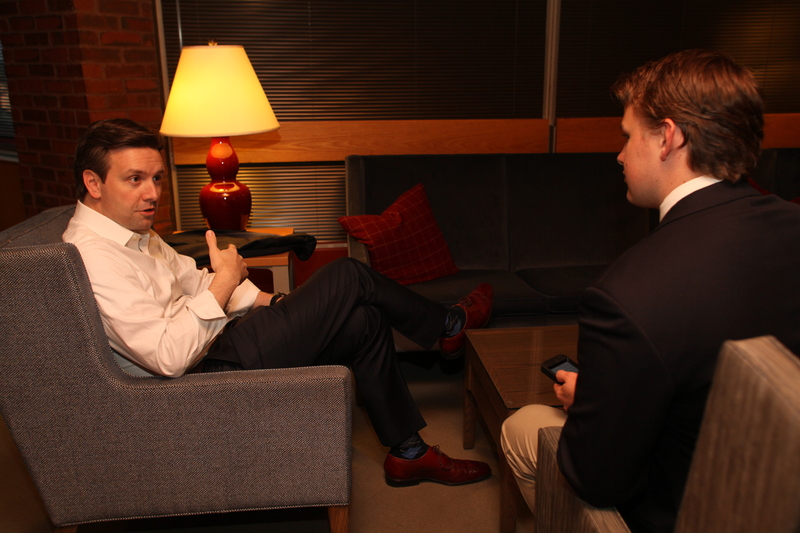 I sat down with the Missouri native before his talk at Harvard's JFK Jr. Forum to get a better understanding of what it means to be Press Secretary. An interesting feature of the White House is that the correspondents work within the walls of the building and travel with the President. This creates a dynamic in which the Press Secretary is in almost constant contact with the journalists he briefs. When asked about this situation, Earnest said that "there is a mutual interest" in maintaining a professional relationship, as the Press Office may, for example, have "an interest in placing a story." On the other hand, correspondents rely on the Press Office for information. The other key interaction for the Press Secretary is, of course, with the President. Being the mouthpiece of the Administration, Earnest must work closely with President Obama to present the views of the Administration in the best way possible. I asked Earnest if he ever disagrees with the President about how to present information to the press. "Of course" he responded, "but I would say we agree more than we disagree." Earnest acknowledged that, ultimately, he is in his current position because the President and senior staff members significantly value his opinion on press and public-perception issues. But he says that "on those rare occasions where there might be a disagreement, I spend a lot of time thinking through my position to make sure that I actually disagree" because President Obama's "instincts in communicating to the public are unmatched." Would President Obama make a good Press Secretary? "He'd be an excellent Press Secretary," according to Earnest, who believes that while the President is speaking for himself in his current role, he would be just as effective if he were speaking for someone else. Back to The West Wing. "There are some days where we have two or three or sometimes even four big things that happen," says Earnest, and it is on those days where the White House can feel like the TV show. He also says that the show accurately conveys "the punishing pace of life in the White House." But the show still deviates from reality. Earnest maintains that "in the real West Wing, people are not always that good looking and that articulate." Brendan is a member of the Harvard College Class of 2018, concentrating in Statistics. He is Press Co-Chair on the JFK Jr. Forum Committee. In addition to politics, Brendan is passionate about sports analytics and is the Soccer Data Analyst for the Portland Timbers. He is originally from Bend, Oregon.